Size: 23 x 3.5 Front Wheel. 23 X 3.5 Manhattan Billet Front Wheel fits 2000 thru 2007 Harley Touring models. NOTE: Front-End must be raked 6 degrees for proper fitment. NOTE: Will not fit models with ABS front brakes. Billet polished hub & rim. Dual flange hub with 5/16 rotor bolt holes. Complete with bearings, seals and end play preset. Uses OEM mounting hardware; designed to use OEM or Manhattan rotors. To Lower 48 States USA. Be sure to add me to your. 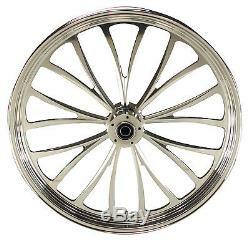 The item "MANHATTAN FRONT BILLET WHEEL 23 X 3.5 HARLEY ELECTRA GLIDE ROAD KING STREET" is in sale since Monday, July 24, 2017.